The tenth issue of The Nightwatchman is out now. Having made it (relatively unscathed) through to double figures, we’re now looking to push on and even play slightly more expansively. This issue comes out at the start of June, as the country – or the cricket-loving element of it at least – prepares for another Ashes series. It might not feel like it right now, but England have won their last three home series against the Aussies, with the most memorable of them all (apologies, Sir Ian) celebrating its tenth anniversary this year. It is unlikely to fade out of the memory any time soon but we’ve made sure it gets star billing here as Rob Smyth, Patrick Collins and Dan Waddell open up with their takes on that summer, and we provide a pictorial reminder as well. Elsewhere, we have a great mixture of articles, although there is undeniably a leitmotif of wistfulness, mourning even, running through this edition. Huw Richards pays tribute to his friend Mike Marqusee, Dilip D’Souza laments the withering of the Ranji Trophy, Damian Broomhead reveals the connection between his brother’s death and a cricket ball in Japan, and David Tossell looks at a laughable, lamentable period in English cricketing history. But there are submissions which buck the trend towards tristesse. Richard Beard gets inside the heads of eleven very different batsmen, separated only by their place in the batting order, Geoff Lemon looks at the part women play – or don’t – in the game, Sean Ingle rediscovers the joys and of table-top cricket, Telford Vice and Felix White attend the World Cup and provide individual takes on the tournament, Julian Norridge, Joe Wilson and Martin Claytor approach county cricket from different angles, Liam Herringshaw looks at an art that has all but passed, and finally Liam Cromar calls for the tradition of the jug to go global. For the third successive year, we also present the outstanding images from the Wisden–MCC cricket photograph of the year competition. 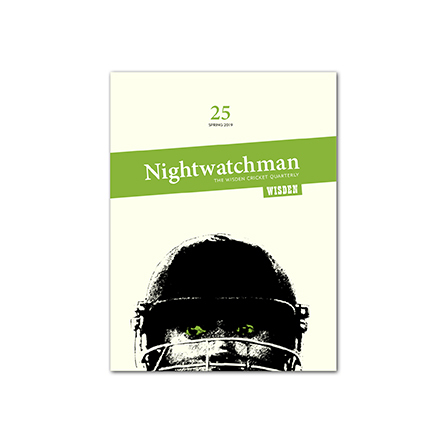 We are very happy to continue our association with this competition – great imagery is a key part of The Nightwatchman and we know from reader feedback how much this section is appreciated. If you’ve not done so already, you can order your copy of Issue 10 here.